This document attempts to cover MOST subdivision eventualities. The process therefore appears onerous. It does not necessarily follow the complete path setout below. You have the choice of dealing with certain matters yourself with or without our guidance, or if you so desire, we can handle the whole matter on your behalf. Firstly, have a look at these links relating to Survey Fees, Terms of Contract and Survey Methology. When you make your first contact, we will give general advice without making any enquires unless simple and undertake what searches we can over the net without cost and give general advice, free of charge. If you require zoning advice and discussions with Councils etc to take place then after you have requested us to proceed we then seek to recover our time and costs. Consultants fees are applicable. We will look at the subdivision process in general and zero in on various aspects for further clarification. Note that simple single lot subdivisions may not generate some or all of the issues raised below; however some will! What follows therefore is general in nature; in some cases an issue arises that needs special attention and clarification. The text in “quotation” marks & italics is taken from our standard documents forwarded to clients at the time of lodging an application with Council & to solicitors requesting the Schedule of Easements. It is inserted to highlight various aspects of the process. Those subdivisions not requiring Council Approval (a Council permit) will be dealt with later in this brief. A subdivision requiring Council Approval (a Council permit) tracks the following general path: Also see the attached pdf below for a general spreadsheet of items that will be possible cost issues. Search of Information: The surveyor takes responsibility for utilising the most up to date survey information. Therefore, whilst an owner with a copy of his title or survey information is of assistance in this process, the surveyor must still undertake his own Search of records. This generates a State Government cost that becomes part of time and costs accounted to the client. Search involving plans that are done by hand by Titles Office staff generate time costs accordingly. Occasionally search is required that involves a professional search which generates further costs. Council and other records may also be sought. Discussions & Advice: It is essential to determine from the client ‘what are they trying to achieve’. This seems simple but it is important to know the subdivision envisaged is to: generate cash? reduce maintenance? better amenity? etc. Discussions are held with Council officers in an attempt to be fore-warned of most issues that may arise in the process. This information is then passed onto the client and a determination made whether to proceed with the application or not. Note at this point we are still ‘best guessing’; we will only really know the full issues once we lodge an official application. 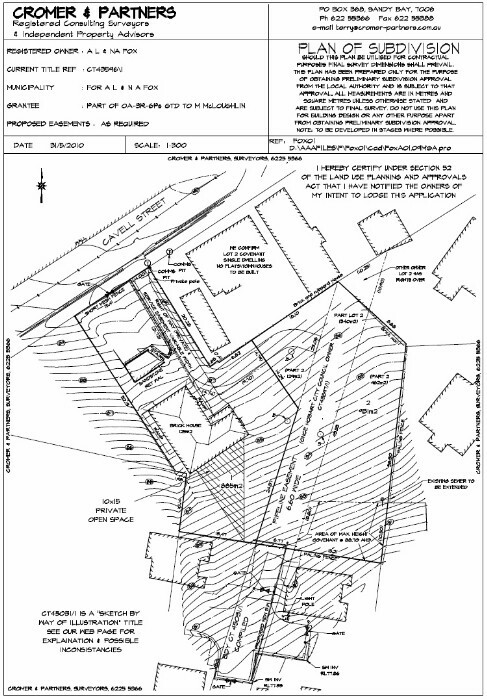 Lodgment of the Proposal Plan (Plan of Subdivision): The lodgment of the Proposal Plan and supporting documents with Council then follows. Most councils require assessment & advertising fees to accompany the application at this time, together with copies of title documents, any associated reports and a Development Application (DA). The DA includes a declaration by the surveyor that the owners of the land are aware of the application and agree with same, together with an authority to allow the general public to ‘look’ at the application documents within council. It is assumed by us that you agree to the above and have viewed our links relating to Survey Fees & our Terms of Contract. Note also that if in a location where Sewer or water supply will be/is provided, TasWater will require an indicative report by an Engineer (or may be persuaded to accept a sketch plan by 'others, such as plumbers, contractors etc' that gives them the information they require) indicating the proposed services design and locations of same. This is required upon lodging the Proposal with Council or will form part of an RFI (Request for Further Information) that will immediately issue from TasWater upon Proposal lodging. If proposed services are within 2.00 metres of existing house footings further plans and cross-sections will be required. Planning Appeals shall be instituted by lodging of a notice of appeal with a Clerk of the Resource Management and Planning Appeal Tribunal . 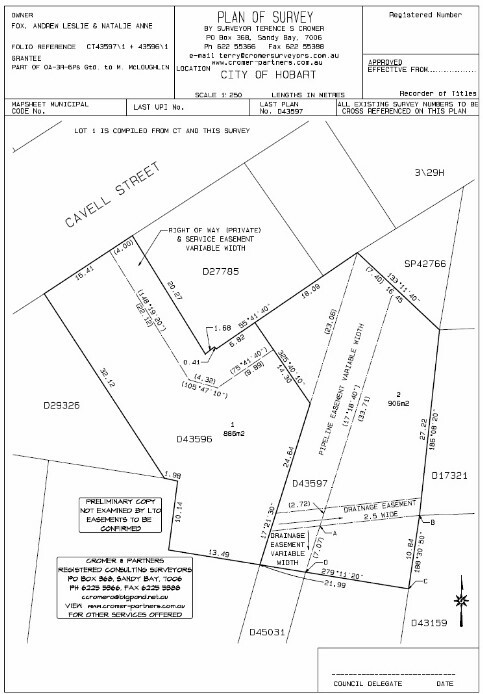 Permit Conditions: This is a critical point in the subdivision process. See attached pdf below for a general spreadsheet of possible cost issues. All permit conditions must be completed before council will allow new titles to issue (THAT MEANS EVERY SINGLE CONDITION MUST BE TOTALLY SIGNED OFF TO THEIR SATISFACTION, NOT YOURS!). The Lands Titles Office is not the delay in the process or the Council, it is the subdividor thinking "that will do" in relation to Permit Conditions. The subdividor MUST get every condition signed off in writing that the Council is satisfied. Do not underestimate this process; this can hold you up for weeks, months or even years. In some circumstances it is possible to lodge a Bond & Guarantee with Council to allow sealing of the survey plan. This process still requires the completion and approval of any engineering design involved, any additional reports required, all legal documents and the completion of the Final Field Survey, surveyors field notes and relating fees. Permit contributions, Headworks Charges , fees & charges must be attended to (in fact the only matters covered by the bond are construction matters). Bonds may be lodged part way through the construction process. Bond amounts are calculated on the outstanding construction cost plus a loading (usually around 25%). If under a Permit a Part V Agreement is required to be entered into, then the permit does not take effect until the day the agreement is executed. LUPAA defines ‘agreement’ as an agreement entered into under Part 5 of LUPAA. The effect of these provisions is that a permit does not take effect until after any required Part 5 Agreements have been entered into. Any use or development undertaken in reliance on the permit prior to the Part 5 Agreement being executed may be in breach of the planning scheme. Let us use the Council Development Application Fees (usually around $800) and the Lands Titles Office fees (usually around $1000) as a base unit (say $2000). Public Open Space Contribution could cost 3x and quiet easily 8x this unit. Engineering design costs could cost 2x and upwards of this unit. Plan of Survey, Plan Sealing & Titles: The completion of Permit Conditions and Survey Documentation allows the Survey Plan (Plan of Survey..see the second plan above and note that both plans reflect the same land, one prepared before Title Survey work and the other AFTER Title Survey field work) to proceed to Council & the Lands Titles Office for issue of new titles. Again the tortuous path here is ‘getting through’ the council and obtaining a Seal on the survey plan. All sections of Council must sign off on their own respective responsibilities, particularly planning, health & engineering. Further, the Water Authority (now TasWater) now play a big part in the Final Approval process, requiring a full As Constructed Survey of all new features + a plan relating. These regulations were upgraded in 2013 and have become quite onerous. They will be especially interested in ensuring that all permit conditions have been satisfied. This is the last opportunity for Council to ensure compliance with Permit Conditions and the intent of the Permit. Other Forms of Subdivision: there are other forms of subdivision that exist that are not as common. Strata Subdivision is the most common, followed by the resurrection of old Grant Lots . These are tricky areas requiring expert individual advice. Please contact relating.